Client startup and main loop. Callback from the event loop triggered when server input is available. Definition at line 177 of file main.c. 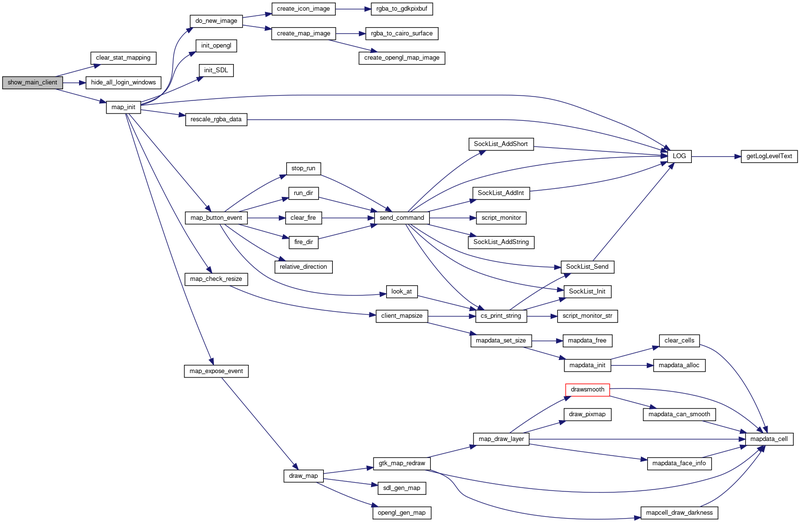 References client_is_connected(), client_run(), draw_lists(), maxfd, script_fdset(), and script_process(). Map, spell, and inventory maintenance. Definition at line 103 of file main.c. 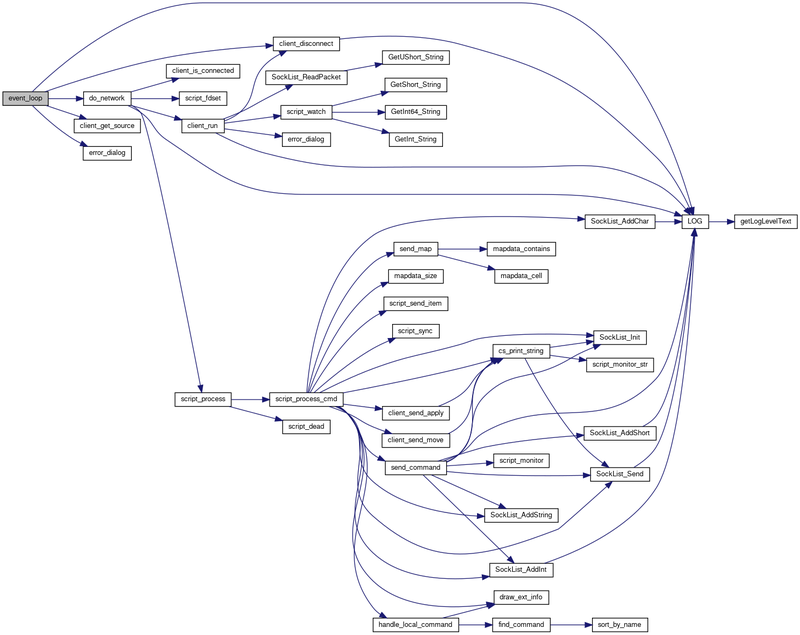 References cpl, inventory_tick(), magic_map_flash_pos(), MAGIC_MAP_PAGE, map_notebook, mapdata_animation(), Player_Struct::showmagic, Player_Struct::spells_updated, tick, and update_spell_information(). Set up, enter, and exit event loop. Blocks until event loop returns. Definition at line 203 of file main.c. References client_get_source(), do_network(), do_timeout(), LOG(), LOG_DEBUG, and redraw(). Called if event_loop() exits, or whenever the character selection window comes up (before logging in, or after having applied a bed). References cpl, locate_item(), Player_Struct::ob, remove_item_inventory(), server, and window_root. Referenced by choose_character_init(), and main(). Definition at line 322 of file main.c. References colorname, config_init(), DEFAULT_UI, DIALOG_FILENAME, dialog_xml, error_dialog(), focusoutfunc(), info_init(), init_create_character_window(), init_menu_items(), init_theme(), init_ui_layout(), inventory_init(), keyfunc(), keyrelfunc(), keys_init(), load_theme(), load_window_positions(), LOG(), LOG_DEBUG, magic_map, metaserver_ui_init(), msgctrl_init(), NUM_COLORS, on_drawingarea_magic_map_expose_event(), on_window_destroy_event(), pickup_init(), root_color, stats_init(), window_root, window_xml, and window_xml_file. Load the UI from the given path. On success, store path in window_xml_file. Definition at line 310 of file main.c. References client_init(), client_negotiate(), client_reset(), config_check(), config_load(), CONFIG_SOUND, event_loop(), FULL_VERSION, hide_main_client(), init_image_cache_data(), init_sockets(), init_sounds(), init_ui(), MAX_BUF, metaserver_show_prompt(), parse_args(), reset_image_data(), use_config, VERSION_INFO, want_config, and window_xml_file. parse_args: Parses command line options, and does variable initialization. argv Parse command-line arguments and store settings in want_config. This function should be called after config_load(). Definition at line 233 of file main.c. References LOG(), LOG_DEBUG, MINLOG, options, and VERSION_INFO. Redraw the map. Do a full redraw if there are new images to show. 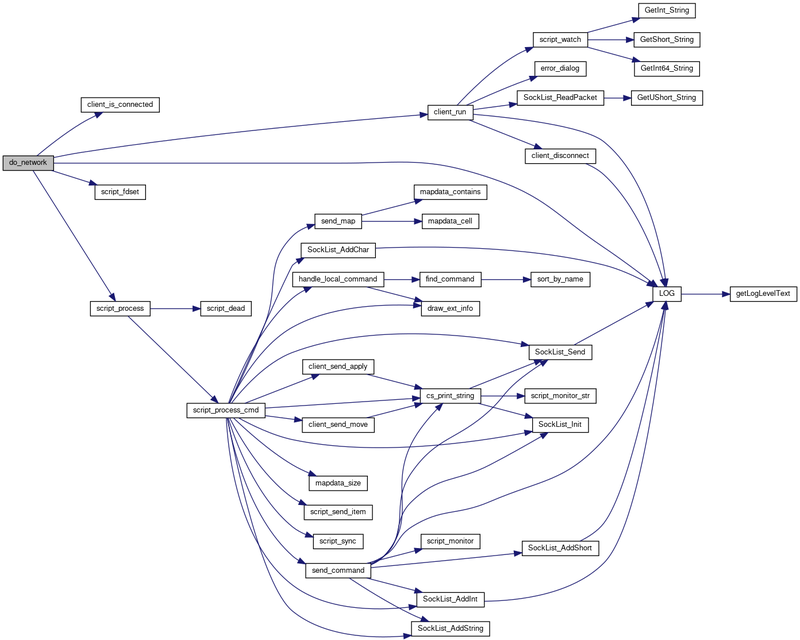 References Player_Struct::container, cpl, draw_lists(), draw_map(), have_new_image, item_struct::inv_updated, next_tick, and Player_Struct::ob. Referenced by event_loop(), and StatsCmd(). Show main client window. Called after connect if server does not support new loginmethod, or after character is selected. Definition at line 410 of file main.c. References clear_stat_mapping(), map_init(), and window_root. Definition at line 38 of file main.c. Definition at line 86 of file main.c. Referenced by config_init(), init_account_password_window(), init_add_character_window(), init_choose_char_window(), init_create_account_window(), init_create_character_window(), init_login_window(), init_new_character_window(), init_ui(), keys_init(), menu_about(), menu_clear(), metaserver_ui_init(), on_skills_activate(), on_spells_activate(), and update_skill_information(). Definition at line 87 of file main.c. 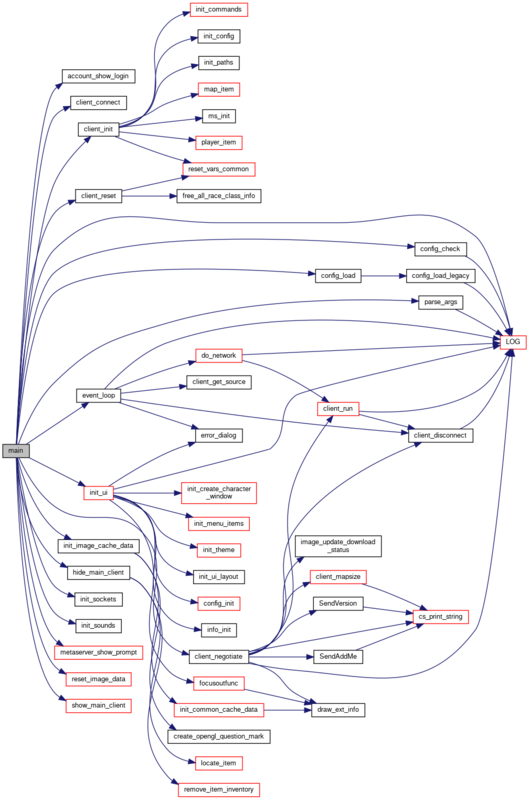 Referenced by draw_magic_map(), init_ui(), and magic_map_flash_pos(). Track whether the client has received a trick since the last redraw. Definition at line 90 of file main.c. Referenced by client_tick(), and redraw(). Command line options, descriptions, and parameters. Definition at line 62 of file main.c. Referenced by on_spell_cast_clicked(), on_spell_invoke_clicked(), on_spell_treeview_row_activated(), and parse_args(). Definition at line 25 of file sound.c. Referenced by hide_main_client(), init_sounds(), MusicCmd(), and Sound2Cmd(). Definition at line 50 of file map.c. Definition at line 54 of file main.c. Referenced by hide_main_client(), image_update_download_status(), init_account_password_window(), init_add_character_window(), init_choose_char_window(), init_create_account_window(), init_create_character_window(), init_image_cache_data(), init_login_window(), init_new_character_window(), init_ui(), metaserver_ui_init(), save_winpos(), and show_main_client(). Referenced by init_menu_items(), init_ui(), init_ui_layout(), inventory_init(), keys_init(), load_window_positions(), map_init(), pickup_init(), save_winpos(), and stats_init(). Definition at line 82 of file main.c. Referenced by config_load(), config_load_legacy(), init_ui(), init_ui_layout(), main(), read_config_dialog(), save_defaults(), setup_config_dialog(), and ui_name().